We should never underestimate the power of words. A few properly chosen words, spoken or sung, can change history. La Marseillaise inflamed mobs during the French Revolution. Lincoln’s “Gettysburg Address” inspired the Yankees to continue giving “the last full measure of devotion.” The Horst Wessel Song fueled the dictatorship of Nazi Germany. We Shall Overcome unified the civil rights movement. And the songs of Bob Dylan and the Beatles helped create an entire counterculture. But all these words, powerful as they were, couldn’t solve the real problems of existence—repeated birth, old age, disease, and death. Time passed, the impact of these songs and pronouncements faded, people forgot. And the inexorable problems of life in the material world continued unabated. According to the Vedic literatures, shabda-brahman can awaken us from our materialistic slumber. But this spiritual sound must be received from those adept at the process of bhakti-yoga, devotional service to the Supreme Lord. In other words, these sounds may be given to the common man, asleep to spiritual life, by one who is awake and fully cognizant of his spiritual nature. Such an initiator into the truths of spiritual sound is called a guru, or spiritual master. The Vedic literature asserts that the nonpareil of all spiritual sounds is the Hare Krishna maha-mantra, the Great Chant for Deliverance—Hare Krishna, Hare Krishna, Krishna Krishna, Hare Hare/ Hare Rama, Hare Rama, Rama Rama, Hare Hare. Chanting these sixteen words is the best way to awaken to our spiritual life. The word Krishna is a name of God meaning “the all-attractive one,” Rama means “the all-pleasing one,” and Hare is an invocation to Hara, Krishna’s internal spiritual energy. Thus the Hare Krishna mantra is a prayer to the Lord and His energy for the privilege of engaging in His service. If we regularly hear and chant this sound vibration, we will become pure, enlightened, and awake to our eternal life of bliss and knowledge in the service of the Lord. Although anyone can start chanting Hare Krishna at any time and make definite spiritual progress, there is an art and science to chanting. Lord Caitanya Mahaprabhu, Krishna Himself in the role of His own devotee, appeared in Bengal, India, five hundred years ago to teach that art and science. Lord Caitanya based His teachings on authoritative Vedic texts like Bhagavad-gita and Srimad-Bhagavatam. He taught that the name of the Lord is His sound incarnation and that since the Lord is absolute there is no difference between His name and Him personally. Thus, by chanting the holy name of God, we can directly associate with Krishna through sound. As we become adept at chanting and hearing the Hare Krishna mantra, we pass through three stages: the offensive stage, the clearing stage, and the perfected stage. In the offensive stage we still desire various kinds of sense pleasure, but we are struggling to become pure. In the second stage we clear off all material contamination and begin to taste the real nectar of the name. And in the perfected stage we attain the most coveted goal—pure love of God. Lord Caitanya taught that love of God is the highest goal of all living beings, the very essence of authentic spirituality. The mission of the Hare Krishna movement is to follow, realize, and propagate the teachings of Lord Caitanya. The information in the Vedic literature about sound vibration and man’s relationship with God is extremely confidential. Nonetheless, by the mercy of His Divine Grace A.C. Bhaktivedanta Swami Prabhupada, who first propagated the Hare Krishna mantra outside India, everyone can now enter into the mysteries of these divine truths simply by chanting the transcendental names of God—Hare Krishna, Hare Krishna, Krishna Krishna, Hare Hare/ Hare Rama, Hare Rama, Rama Rama, Hare Hare. These are truly the words that are changing history. To the casual visitor, this holy land is much like the rest of rural India. To the devotee of Lord Chaitanya it is a transcendental paradise. To the uninformed, this spacious flat farming area near the junction of the Ganges and Jalangi rivers may seem like the rest of rural India. The heavy bulls turning clods of earth with hefty plows, the thatch-roofed mud houses, the ancient- looking riverboats, and the slight, wide-eyed people make the customary sights and conveniences of the West no more significant or relevant than a faint memory. Navadvipa—literally “Nine Islands”—is a sacred tract of land in West Bengal. The nine islands, sculpted by the fingers of the Ganges as she reaches down to the Bay of Bengal, are dotted with numerous towns and villages and checkered with plots of farmland—wheat, rice, beans, sugar cane—and occasional groves of bananas, coconuts, or papayas. But Navadvipa is much more than a quaint, picturesque area where time has all but stopped. It is the birthplace of Lord Chaitanya. It is transcendental. He wanted to fully relish the sweetness and depth of a devotee’s love, and He wanted to show people how to best evoke their dormant love of God. Because Lord Chaitanya benevolently distributed that transcendent love to everyone, He is known as the most munificent incarnation. His method was sankirtana, the congregational chanting of the names of God. This, He taught, is the most expedient way to become self-realized in this age. Lord Chaitanya is the ideal teacher of life’s prime necessities. He is the complete reservoir of all mercies and good fortune, and He is worshipable by everyone in this age of disagreement. Everyone can join in His sankirtana movement. No previous qualification is necessary. Just by following His teachings, anyone can become a perfect human being.... I sincerely hope that by understanding the teachings of Lord Chaitanya, human society will experience a new light of spiritual life that will open the field of activity for the pure soul. The bus rumbles along the narrow winding road, looking incongruous among the bullock carts, rickshas, cows, goats, and pedestrians. The pilgrims peer out the windows. Five centuries ago. 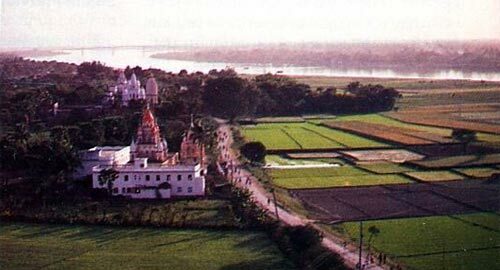 Lord Chaitanya used to tread this very land daily, and the white-steepled temple that the bus passes marks the place where, on February 18, 1486, the Lord appeared. The funds to purchase the land and build this temple were raised by the great forefather of the Hare Krishna movement, Srila Bhaktivinoda Thakura. A century ago Srila Bhaktivinoda researched extensively to discover the exact site of Lord Chaitanya’s birth. After his findings were confirmed by his spiritual master, he personally arranged for the construction of the sacred shrine that still stands today. At Srila Prabhupada’s temple, Mayapur Candrodaya Mandir, just one mile from Lord Chaitanya’s birthplace, the bus finally stops. Each year since 1972 Srila Prabhupada’s disciples from all over the world have joined together in Navadvipa to celebrate the appearance day of Lord Chaitanya. And this year—1986—will be the largest and grandest celebration—the quincentennial. What Srila Prabhupada and his predecessors and followers have done in broadcasting the glories of Navadvipa is similar to what Lord Chaitanya and His followers did five hundred years ago to broadcast the glories of Vrindavana. Vrindavana is a beautiful area not far from Delhi (but seven hundred miles from Navadvipa) where Lord Krishna passed His childhood and youth during His appearance fifty centuries ago. Forty-five centuries later, when Lord Chaitanya visited Vrindavana, it was a miniscule, relatively unheard-of and undeveloped farming village. Lord Chaitanya requested six of His leading disciples to live there, establish temples, excavate the holy places of Krishna’s pastimes, and write books about Krishna consciousness. As a result, Vrindavana today is famous among all Hindus and devotees. Hundreds of thousands of pilgrims regularly visit the thousands of temples and holy places of Vrindavana. In Navadvipa, Srila Bhaktivinoda, Srila Bhaktisiddhanta, and Srila Prabhupada have also founded temples, excavated the holy places of Lord Chaitanya’s pastimes, and written books on Krishna consciousness. In one sense Vrindavana and Navadvipa are one, as much as Lord Krishna and Lord Chaitanya are one, being the same Supreme Person in different features. But in another sense, although one, Vrindavana and Navadvipa are simultaneously different, as are Lord Krishna and Lord Chaitanya. Navadvipa is the crest jewel of all holy places, being the most merciful of all. In other places of pilgrimage (like Vrindavana), an offender is severely punished, but in Navadvipa the offender is not only forgiven, he is purified and receives the treasure of love of God. One who lives in Navadvipa is very fortunate, for he attains ecstatic love for Krishna birth after birth. One who happens to go there becomes freed from all offenses. What one attains by traveling to all other holy places is attained just by remembering Navadvipa, and what yogis attain after ten years is attained in Navadvipa in three nights. The impersonal liberation one gets after arduous endeavor at other holy places you can get simply by bathing in the Ganges at Navadvipa. In fact, all material enjoyments and liberation remain as obedient servants to the pure devotees in Navadvipa. Since no material thing or person is ever situated in Navadvipa, a film of dull matter has been spread over it to keep it covered from the materialist. The people who have no relationship with Lord Chaitanya simply live on top of that covering, blind to the real truth. Though one is thinking, “I am in Navadvipa,” maya [illusion] happily keeps Navadvipa far away from that person. When the eastern horizon becomes tinged with the redness of sunrise, Lord Chaitanya, taking His devotees with Him, journeys through the towns and villages of Navadvipa. The mridangas resound and the hand cymbals play in time, and Lord Chaitanya calls to the sleeping people, “Wake up, sleeping souls! Wake up, sleeping souls! You have slept so long on the lap of the witch Maya. I have brought the medicine for destroying the illusion of Maya. Chant this maha-mantra: Hare Krishna, Hare Krishna, Krishna Krishna, Hare Hare/ Hare Rama, Hare Rama, Rama Rama, Hare Hare. This festival celebrates the appearance of Chaitanya Mahaprabhu. 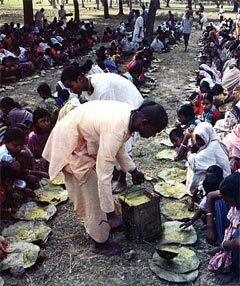 It is observed annually (in February - March) by Krishna devotees all over the world—especially in the area of Mayapur, India, the place where Mahaprabhu appeared in the year 1486. Those who witnessed Mahaprabhu's pastimes saw Him dance and chant with ecstatic love for God, the likes of which had never been seen before. He encouraged everyone to follow this same process. 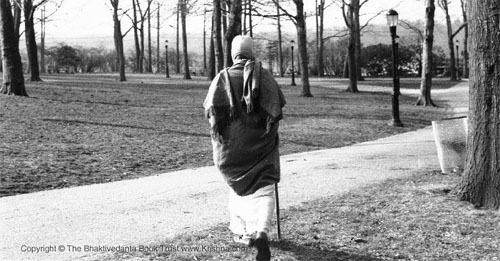 He taught that anyone—regardless of background or spiritual qualification—could develop their innate love of God and experience great spiritual pleasure by chanting the Hare Krishna mantra. 2)	The Lord blesses everyone with the soothing, moonlike rays of His sublime teachings. Food: Gaura Purnima festival menu - Cooking for Gaura Purnima? Here are some recipes to try. In honor of the appearance of Sri Chaitanya Mahaprabhu, we present the following excerpt from the Atharva Veda, one of the four original books of the Vedic literature. These texts reveal that in the present age Sri Chaitanya Mahaprabhu is the incarnation of God and the Hare Krishna maha- mantra is the recommended mantra for progress in spiritual life. atha pippaladah samit-panir bhagavantam brahmanam upasanno bhagavan me shubham kim atra cakshasveti. sa hovaca, bhuya eva tapasa brahmacaryena shashvad ramasva mano vasheti. sa hovaca. rahasyam te vadishyami—jahnavi-tire navadvipe golokakhye dhamni govindo dvi-bhujo gaurah sarvatma maha-purusho mahatma maha- yogi tri-gunatitah sattva-rupo bhaktim loke kasyatiti. tad ete shloka bhavanti. The one Supreme Personality of Godhead, who is the master of all transcendental potencies, and who may be known only by devotional service, appears in innumerable transcendental forms. He has appeared with red, black, and white complexions, and He shall also appear in the golden form of Sri Chaitanya Mahaprabhu. He shall assume the role of the perfect devotee, and He shall teach the conditioned souls the path of pure devotional service. I offer my respectful obeisances unto Lord Sri Krishna, the all-pervading Personality of Godhead, who is understood by the study of Vedanta philosophy. He is the master of all transcendental potencies, and He appears as Sri Chaitanya Mahaprabhu. One who understands that Sri Chaitanya Mahaprabhu is the Supreme Personality of Godhead, who is known by the study of Vedanta philosophy, who is the original cause of the universe, and who is the oldest, the original person, crosses beyond this world of birth and death. This is the proper understanding of the Supreme Personality of Godhead, and aside from this there is no other way for one to achieve liberation. dve shakti parame tasya hladini samvid eva ca iti. In this way the Supreme Lord manifests two of His transcendental potencies: His hladini shakti (the potency of transcendental bliss) and samvit shakti (the potency of transcendental knowledge). sa eva mula-mantram japati harir iti krishna iti rama iti. The Supreme Lord will chant a mantra consisting of the names of Hari, Krishna, and Rama (the maha-mantra: Hare Krishna, Hare Krishna, Krishna Krishna, Hare Hare/ Hare Rama, Hare Rama, Rama Rama, Hare Hare). harati hridaya-granthim vasana-rupam iti harih. krishih smarane tac ca nas tad-ubhaya-melanam iti krishnah. ramayati sarvam iti rama ananda-rupah atra shloko bhavati. These three names of the Supreme Lord (Hari, Krishna, and Rama) may be explained in the following way: (1) “Hari” means “He who unties [harati] the knot of material desire in the hearts of the living entities”; (2) “Krishna” is divided into the two syllables “Krish” and “na.” “Krish” means “He who attracts the minds of all living entities,” and “na” means “the supreme transcendental pleasure.” These two syllables combine to become the name “Krishna”; and (3) “Rama” means “He who delights [ramayati] all living entities,” and it also means “He who is full of transcendental bliss.” The maha-mantra consists of the repetition of these names of the Supreme Lord. The maha-mantra (Hare Krishna, Hare Krishna, Krishna Krishna, Hare Hare/ Hare Rama, Hare Rama, Rama Rama, Hare Hare) is the best of all mantras. Although it is very difficult to understand the maha-mantra, it may be understood when one engages in pure devotional service of the Supreme Lord. namany ashtav ashta ca shobhanani, tani nityam ye japanti dhiras te vai mayam atitaranti nanyah paramam mantram parama-rahasyam nityam avartayati. Chaitanya eva sankarshano vasudevah parameshthi rudrah shakro brihaspatih sarve devah sarvani bhutani sthavarani carani ca yat kincit sad-asat-karanam sarvam. tad atra shlokah. Lord Chaitanya Mahaprabhu is the Supreme Personality of Godhead who appears as Lord Sankarshana and Lord Vasudeva. He is the original father of Brahma, Siva, Indra, Brihaspati, all the demigods, and all moving and nonmoving living entities. He is the original cause of all that is temporary and all that is eternal. Nothing exists separately from Him, and therefore He is everything. He is described in the following verses. This material world is temporary, whereas the individual living entities who try to enjoy matter are eternal and superior to it. The Supreme Personality of Godhead is superior to both the temporary material energy and the eternal living entities. Lord Chaitanya Mahaprabhu is this Supreme Person, the Absolute Truth, the original cause of all causes. ya enam rasayati bhajati dhyayati sa papmanam tarati sa puto bhavati, sa tattvam janati, sa tarati shokam, gatis tasyate nanyasyeti. One who worships the Supreme Lord, Sri Chaitanya Mahaprabhu, with devotion and always remembers Him becomes free from all sins and completely pure. Easily understanding the truth about the Personality of Godhead and becoming free from all material lamentation, such a devotee attains the supreme goal of life, which is unattainable by those averse to the Supreme Lord, Sri Chaitanya Mahaprabhu. *According to some scholars, this text can be found in the Purusha Bodhini Upanishad. One of the original leaders of the Hare Krishna movement uses his diplomatic skills to free himself for the Lord’s service. Sanatana Goswami resigned his ministerial post in the Muslim government of sixteenth-century Bengal, having decided to dedicate his life to Sri Chaitanya Mahaprabhu’s mission. The Nawab, or governor, imprisoned Sanatana, angered by his resignation. We now hear how Sanatana met Lord Chaitanya in Varanasi (Uttar Pradesh) and told of his escape from prison and journey out of Bengal. Sanatana Goswami entered the city of Varanasi early in the spring of 1514. 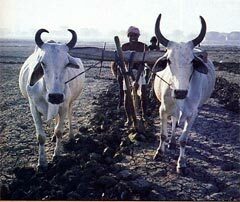 Having journeyed on back roads and jungle paths through Bengal and Bihar, he was dressed in torn and dirty clothes. His long hair, beard, and mustache were unkempt, and he carried a beggar’s pot in his hand. Pleased to hear that Lord Chaitanya Mahaprabhu had arrived by boat from Allahabad, Sanatana went to Candrashekhara’s house, where the Lord was staying, and sat down by the door. Sri Chaitanya Mahaprabhu could understand that Sanatana was outside. Candrashekhara went out to look and, seeing no Vaishnava, came back. “Is there anyone at your door at all?” the Lord asked. “Only a Muslim mendicant,” Candrashekhara replied. “Please bring him here,” the Lord said. Hurrying back to the door, Candrashekhara spoke to Sanatana. Only a few weeks before, Sri Chaitanya Mahaprabhu had met Sanatana’s brother, Rupa Goswami, in Allahabad. The Lord had enlightened Rupa about the soul’s evolution, first through the species of material life in this universe and then, upon reentering the spiritual sky, through the transcendental stages of life in the spiritual creation. For the next two months in Varanasi, Lord Chaitanya would elaborate on these and other topics in His teachings to Sanatana Goswami. He would describe how the Supreme Lord expands Himself to individually preside over the innumerable spiritual planets and to create and govern the material universes. He would inform Sanatana about the location and dimensions of the spiritual planets and about the identity and activities of their denizens as precisely as one might describe the continents and nations of this earth. And He would delineate the direct route through the dark and temporary material cosmos to these effulgent and deathless spiritual destinations with as much clarity and detail as the best modern road maps and travel guides. Despite the exalted, revolutionary nature of these pending transcendental topics, however, Lord Sri Chaitanya Mahaprabhu was Himself curious to know about Sanatana’s recent travels and adventures. 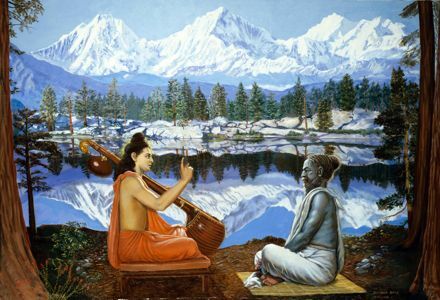 “How did you escape from prison?” the Lord eagerly asked, and Sanatana happily told his story from beginning to end. Sanatana recounted how, bound with iron chains at the Chika Mosjud prison near Ramakeli, Bengal, he had received a note from his younger brother Rupa. Yadupati is a name for Lord Krishna, and Raghupati a name for Lord Ramacandra. Long ago They had appeared on earth and played as human beings, displaying Their eternal pastimes in the city of Mathura and the province of Koshala respectively. 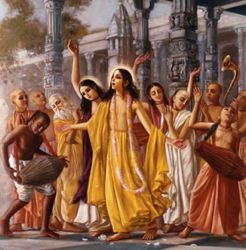 Now They had appeared again as Lord Chaitanya Mahaprabhu to entice mankind from the prison of material life in this temporary universe, and Lord Chaitanya was currently on His way to Mathura, followed by Rupa Goswami. Delighted with the note, Sanatana went to the Muslim jail keeper, an acquaintance from his government days, a simple man with little education or spiritual training. Summoning the diplomatic skills honed during his years as the Nawab’s prime minister, Sanatana began to satisfy the humble warden with praise. Flattered by the compliments from his fellow government servant, the jail keeper could not deny he was indeed a learned scholar and saintly person. He was all ears as Sanatana continued, stressing their long-standing friendship and requesting release as a personal favor. Sanatana sweetened their friendship with an offer of five thousand gold coins. By taking the gold and releasing an innocent prisoner, Sanatana explained, his friend the jail keeper would accumulate both piety and material wealth. He would get the best of both worlds. Sanatana had just the alibi. The jail keeper now had a forensic alibi for the Nawab, a religious alibi for his own conscience, and a promise of five thousand gold coins. He was still torn and wavering when Sanatana upped the offer to seven thousand coins and carefully stacked the money before him while he watched. Seeing the gleaming pile of gold growing, the jail keeper finally caved in. That night he broke Sanatana’s shackles and let him escape across the Ganges. Though he now had three thousand coins remaining and hundreds of miles to traverse from Bengal west towards Mathura and Vrindavana, Sanatana left all the gold behind and set out on foot, looking the part of a beggar. The money had bought him release for Lord Chaitanya’s service, but he had no interest in spending for a comfortable journey, nor was carrying gold safe for a lone traveler. As an escaped prisoner, too, and a famous man, Sanatana had to avoid notice. Using back roads and footpaths, he stayed off the highways known as “the way of the ramparts,” which the Nawab had fortified against invasion. A servant named Ishana followed Sanatana, and despite all his master’s evident precautions, Ishana secretly carried eight gold coins. Crossing what is now Bihar province, Sanatana and Ishana came to a hilly area known as Patada and stopped at a small hotel, where the gold proved nearly fatal. The hotel owner learned of the eight coins through an expert palmist and planned to rob and kill his two guests. In the meantime, he went out of his way to be respectful and attentive to their needs, providing them with food to cook and promising to personally guide them through the hills. Sanatana went to the river to bathe, and as he had not eaten for two days, he cooked and had his meal. But he was suspicious. As a minister of the Nawab, he had faced many diplomats and sycophants. Here was a hotel owner, a stranger, giving him the royal treatment, though he and Ishana looked like paupers. “Yes, I have seven gold coins,” Ishana admitted, partially revealing his cache. Sanatana became angry and berated his servant. Taking the seven coins, Sanatana went to the hotel owner, holding the coins before him. The combination of gold and religious sentiments again proved effective. The hotel keeper confessed that he knew that Ishana had eight coins in his pocket and that he had planned to kill both Ishana and Sanatana. Now refusing the coins with embarrassment and chagrin, as an apology he offered to guide Sanatana through the hills for free. With this settlement made, the hotel keeper hired four watchmen who through that entire night escorted Sanatana and Ishana across the hills on a jungle path. Sanatana then sent Ishana home with the gold coin Ishana had tried to conceal and traveled on alone, wearing torn clothing, carrying a beggar’s pot, and losing his worries with every step he took. Walking on and on, Sanatana came one evening to a town named Hajipura and sat down in a garden park. By coincidence a gentleman named Srikanta, the husband of Sanatana’s sister, was in Hajipura on government business. The Nawab had given Srikanta 300,000 gold coins to buy horses. Sitting in an elevated place transacting this business, Srikanta caught a glimpse of Sanatana and later that evening went to see him. The two old friends talked long into the night, and Srikanta heard all about Sanatana’s arrest and escape. Seeing Sanatana, formerly the prime minister, in such a ragged condition distressed Srikanta and got him thinking. With a fortune in gold at his disposal, certainly he could help his wife’s brother get a new start in life. Sanatana had already foiled a greedy jail keeper and a murderous hotel owner, all the while avoiding the Nawab’s soldiers and agents on his way to meet Lord Chaitanya. Now here was a more formidable obstacle: a loving friend and close relative with money to spare. Sanatana thanked Srikanta but declined his offer. Insisting that Sanatana at least take a valuable woolen blanket, Srikanta helped him across the Ganges and with affection saw him on his way again. Sanatana had left Srikanta in Hajipura only a few days before. Now, sitting with Lord Sri Chaitanya Mahaprabhu at Candrashekhara’s house in Varanasi, he was feeling boundless happiness. After hearing about Sanatana’s adventures, Lord Chaitanya in turn recounted His recent meeting with Sanatana’s brothers in Allahabad. Then He asked Sanatana to clean up and get a shave before lunch, and He requested Candrashekhara to provide Sanatana with fresh clothing. Though offered new garments by Candrashekhara, Sanatana requested a used dhoti cloth instead, then proceeded to rip the cloth in pieces to make two sets of clothing. As for meals, a Maharastriyan brahmana who would later host Lord Chaitanya’s lunch with the sannyasis of Varanasi invited Sanatana to take all his meals with him. Again Sanatana politely declined, preferring to avoid full meals and humbly beg a little food from door to door. Sanatana’s renunciation was extraordinary and cannot as a rule be imitated. He was determined to give up material opulence. Even Srikanta’s new woolen blanket had to go. 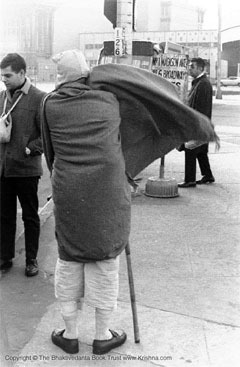 Sanatana went to the bank of the Ganges and persuaded a surprised Bengali mendicant to take the blanket in exchange for the mendicant’s torn quilt. In the days that followed, Lord Sri Chaitanya Mahaprabhu, being pleased with Sanatana Goswami, began to tell him about Lord Krishna’s real identity, transcendental qualities, and eternal activities. Sanatana, freed from his last piece of material attraction, was fully prepared to listen. In the year 1513, the Festival of the Chariots held a special meaning for Maharaja Prataparudra, the king of Jagannatha Puri. ON Ratha-yatra day in the summer of A.D. 1513, Lord Sri Krishna Chaitanya Mahaprabhu and His associates rose in the dark and bathed. The predawn streets were busy with last-minute festival preparations as the Lord and His party hurried to the temple of Lord Jagannatha (Krishna as “the Lord of the universe”). For weeks carpenters and craftsmen had been at work building the festival’s three colossal wooden carts and decorating them with brightly colored canopies, with silk banners and flags, with mirrors, pictures, gongs, bells, camara whisks, and flower garlands. Hundreds and thousands of pilgrims had arrived in Puri to see massive wooden deities of Lord Jagannatha, Lord Balarama, and Subhadra Devi ride through the streets on these festival chariots. The entire town of Puri, residents and guests alike, joyously prepared to serve and glorify the deities, incarnations of the Supreme Lord, during the Jagannatha Rathayatra parade. Maharaja Prataparudra, the king of Jagannatha Puri, was up early too, his mind occupied with the coming events. The king took a personal interest in the Jagannatha temple and in all the details of this annual celebration. The sheltering and feeding of the pilgrim throngs reflected upon him and was his pleasure. Friends and subordinate rulers attended as his guests, not to mention his own queens, children, and retinue. The regular duties of administering a sprawling kingdom up and down the coast of the Bay of Bengal pressed upon him as well. But most of all, for the first time Lord Sri Chaitanya Mahaprabhu would be attending Rathayatra, and Maharaja Prataparudra had the promise of a private audience with the Lord. Along with his festival functions, King Prataparudra could think of little else. When Lord Chaitanya and His party arrived at the Jagannatha Temple, the king and his entourage were waiting to let Him through the crowds and give Him an honored vantage point to watch Lord Jagannatha emerge from the temple. To the tumultuous sounds of various musical instruments, devotees specially chosen for their strength, carried the heavy deities of Jagannatha, Baladeva and Subhadra from the temple to Their festival chariots. Before crowds of his subjects and visitors, King Prataparudra took the part of a lowly street sweeper, using a broom with a golden handle to sweep the road in front of Lord Jagannatha as the deity moved toward His chariot. The king also sprinkled the road with sandalwood-scented water. Seeing this humble public example set by King Prataparudra, Lord Chaitanya became very happy. A king and a street sweeper may be at opposite ends of the social spectrum, but in a society dedicated to the service of Lord Jagannatha everyone equally becomes a menial servant of the deity. We are kings or sweepers temporarily. Our permanent and exalted position is as humble servants of Krishna. Lord Chaitanya Himself had made it clear that He wished most of all to be a servant of a servant of the servants of Krishna, to serve Krishna holding all other servants as superiors. In the two years since Sri Chaitanya Mahaprabhu had first passed through Puri on His way to southern India, King Prataparudra had aspired to meet the Lord and had steadily served Lord Chaitanya’s followers. The king had released Ramananda Raya from government duties and provided him with a generous stipend for Lord Chaitanya’s service. He had respectfully approached Lord Chaitanya’s disciples in Puri and asked them to arrange a meeting with the Lord. And in the past several weeks he had eagerly provided lodging for two hundred of Lord Chaitanya’s followers from Bengal and had enjoyed learning their names and hearing of their exceptional qualities. Now Maharaja Prataparudra had eagerly rendered menial service to Lord Jagannatha. As a humble servant both of Krishna and of Lord Chaitanya’s followers, King Prataparudra greatly satisfied Sri Chaitanya Mahaprabhu, the universal guru, and became a sure candidate for Lord Chaitanya’s mercy. While the Lord continued to outwardly regard King Prataparudra as a sensual materialist and to avoid him, He prepared to bless the king during the Rathayatra parade. As the chariots rolled forward, drawn by sturdy servants of Lord Jagannatha tugging on thick ropes, Sri Chaitanya Mahaprabhu wandered through seven chanting parties. He chanted the holy names and shouted “All glories to Lord Jagannatha! All glories to Lord Jagannatha!” Inspired by Lord Chaitanya’s participation, the devotees chanted and danced with all their hearts, forgetting all fatigue while the hours passed. 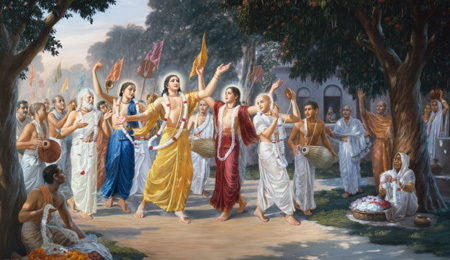 In every direction the sound of the holy names and the music of sankirtana filled the air as Lord Chaitanya, to further raise the blissful atmosphere, displayed His inconceivable potency as the Supreme Personality of Godhead by expanding Himself into seven transcendental forms, dancing and chanting in all seven parties simultaneously. Everyone was thinking, “Lord Chaitanya Mahaprabhu stays with my group, showing us special favor. He does not go anywhere else.” Only the most confidential devotees, those absorbed in pure devotion, could see and understand that seven forms of Sri Chaitanya Mahaprabhu danced and chanted. One of those devotees, standing motionless in stunned astonishment, breathless with the vision before him, was King Prataparudra. Still externally singled out by the Lord as a dangerous worldly man, still refused a personal audience, Maharaja Prataparudra became an intimate devotee of the Lord by the Lord’s mercy, privy to the Lord’s confidential mystic powers. In all the crowds of celebrating pilgrims and among all the assembled followers of Lord Chaitanya, only Sarvabhauma Bhattacarya joined the king in observing and relishing the Lord’s seven-fold transcendental performance. Sri Chaitanya Mahaprabhu’s expansive powers as the Supreme Lord were not all that had transfixed Maharaja Prataparudra. Lord Chaitanya’s demeanor as a devotee of the Supreme transformed the king as well. The Festival of the Chariots is a grand display of opulent worship commemorating the grandeur at Kurukshetra during Lord Krishna’s pilgrimage there with the royalty of the Yadu dynasty. Lord Chaitanya, with His first Rathayatra in this historic summer of 1513, sweetened the joyously opulent celebration of Lord Jagannatha’s glories with ecstatic remembrance of the residents of Vrindavana, who came to the Kurukshetra gathering to see Lord Krishna for the first time in many years. While many kings and devotees at Kurukshetra took satisfaction in observing Lord Krishna’s opulence and in glorifying His position as the Supreme, the villagers of Vrindavana saw Krishna as their fellow villager and prayed that He return home with them. Lord Chaitanya’s absorption in the mood of the residents of Vrindavana shone through in His performance of sankirtana with His devoted Bengali followers. This too entranced King Prataparudra. When the procession reached a place called Balagandi, the carts stopped and from all sides pilgrims as well as local devotees offered their best cooked foods to Lord Jagannatha. King Prataparudra, his queens, ministers, friends, and all other residents of Jagannatha Puri made offerings wherever they could. Taking advantage of this interlude, Lord Chaitanya and His followers went to rest in a nearby garden. Exhausted from hours of dancing and chanting, they lay down on the ground beneath the garden trees and enjoyed the cool, fragrant breezes. King Prataparudra too, setting aside his royal apparel, entered the garden dressed in simple cloth like a devotee of Krishna. Humbly taking permission from Lord Chaitanya’s followers, the king bowed down before the Lord, who was lying on the ground with His eyes closed, and began to expertly massage the Lord’s legs. The king also recited verses from the Srimad- Bhagavatam about Krishna’s pastimes with the gopis. 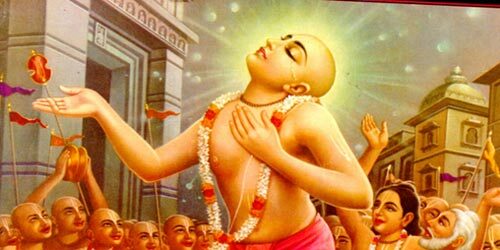 Sri Chaitanya Mahaprabhu was in ecstasy and did not seem to recognize the king. The devotees resting in the garden praised Maharaja Prataparudra’s good fortune in receiving Lord Chaitanya’s mercy, and in doing so their minds became open and blissful. As pure devotees, they were happy to see another servant elevated in devotional service. King Prataparudra replied by offering prayers to the devotees with folded hands. Then he bowed again before Sri Chaitanya Mahaprabhu and humbly left the garden. One of the greatest scholars of his day is about to meet the source of all knowledge. The city of Varanasi lies four hundred miles northwest of Calcutta on the northern bank of the Ganges River. Terraced stone landings, or ghats, leading down to water’s edge extend for four miles along the riverbank. Throngs of pilgrims descend to bathe in the sacred water or climb to explore narrow, winding streets and visit the city’s more than 1,500 temples. While there are historical records of pilgrimages to Varanasi dating back to the seventh century, to the faithful this most sacred of destinations has existed as a bustling holy city for much longer. Many of Varanasi’s temples were destroyed in the seventeenth century during the reign of Emperor Aurangzeb, yet today the view from across the Ganges at Ramnagar suggests timeless splendor. The preeminent scholar in Varanasi at the beginning of the sixteenth century was Prakashananda Saraswati, a renounced priest, or sannyasi, in the line of Sripada Sankaracharya. Prakashananda and his colleagues were masters of the Vedas, the Sanskrit literature that includes extensive writings in every basic field of knowledge. There are Vedic texts on law, art, medicine, mathematics, and other worldly sciences, as well as on yoga, religion, philosophy, and mysticism. Veda means “knowledge,” and in the broadest sense all knowledge is part of the Vedas. Prakashananda Saraswati was particularly adept at analyzing the codes of the highly philosophical Vedanta-sutra. The Vedic texts, divided by Srila Vyasadeva, the literary incarnation of God, culminate in the Vedanta-sutra, in which Vyasadeva expounds upon the eternal nature, origin, and purpose of existence. Anta means “end,” so the Vedanta-sutra establishes that all fields of knowledge are meant to reach the end, or goal, of knowledge by understanding the meaning of life. 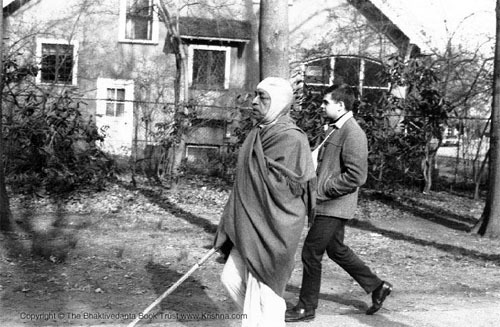 During a lecture at the Massachusetts Institute of Technology in 1968 Srila Prabhupada challenged his audience to explain why, with all the fields of knowledge at their university, they didn’t have a department to study the difference between a living body and a dead body. We study medicine to keep our bodies healthy, politics and sociology to keep them organized, psychology to manage our minds. All these departments benefit living bodies and minds, but what is that life, that living energy we so attentively serve? Where is that knowledge? Or in other words, where is Vedanta? Lacking a Vedanta department, the other departments are incomplete. There was no such lack at Varanasi. As a peerless commentator on the Vedanta-sutra, Prakashananda Saraswati was dean of the Varanasi scholars, who as professors of the Vedas were not mere dogmatists spouting creeds but genuine researchers, writers, and teachers drawn to essential truth. The city of Varanasi had long been a great center of learning and culture. With students arriving from all over India to obtain a comprehensive education in the Vedic wisdom, Varanasi was a hotbed of enlightenment. Prakashananda and his associates presided, enjoying their intellectual pursuits, their followings, and their tenure as leaders of an academic and cultural mecca. The only disturbance to the peaceful academic atmosphere—a disturbance that has also surfaced today in modern college towns and other centers of enlightenment—was a noisy, enthusiastic band of Hare Krishnas chanting and dancing through the streets. With no apparent respect for even minimal academic decorum, these apparent fanatics, beating on drums and clashing hand cymbals, were gathering a following, Prakashananda noticed, among some of the simpler students and townspeople. Their twenty-eight- year-old leader, Sri Krishna Chaitanya, who lived in Bengal, had a golden complexion and a thundering voice. Like Prakashananda and his colleagues, He was a sannyasi in the disciplic line of Sripada Sankaracharya. But Sankaracharya had taught his followers to give up worldly pleasures like singing and dancing and to instead always study the Vedanta- sutra. So who did this Krishna Chaitanya think He was, and what did He think He was doing? It may have disturbed Prakashananda more to know that Krishna Chaitanya was far from illiterate. Before accepting the sannyasa order at the age of twenty-four, He had been known as Nimai Pandita and had run a popular Sanskrit academy of His own at Navadvipa, in what is now West Bengal. Navadvipa was an even more important center of learning than Varanasi. At this time in India, as in previous ages, scholarship had some of the flavor of modern sports events, with learned panditas challenging each other to compete in displays of erudition. While still a schoolboy, Nimai Pandita defeated many champion scholars, including Keshava Kashmiri, a brahmana from Kashmir who had won titles all over India. When Keshava Kashmiri came to Navadvipa looking for some action, the local scholars hid in fear, leaving the contest to Nimai. After several years of showing His intellectual prowess, Nimai Pandita focused His energies on promoting sankirtana, public congregational chanting and dancing in glorification of God. In Navadvipa the loud chanting of Krishna’s names had provoked the local Muslims to complain to Navadvipa’s magistrate, or Kazi. The Kazi descended upon a chanting party one evening, broke a sankirtana drum, and forbid further chanting on the streets of the city. 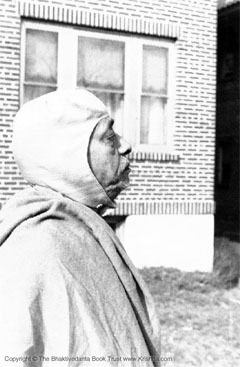 In response Nimai Pandita organized a nonviolent protest, surrounding the Kazi’s house with thousands of chanting, dancing demonstrators. The Kazi was intimidated by the crowd, but Nimai’s demeanor was peaceful. In a friendly exchange He convinced the Kazi of the importance of chanting the Lord’s names. Although Nimai chanted the Hare Krishna mantra in particular, He taught that this “no other way” applies to any place and time, and to any recognized name of the Lord. A verse in the Srimad-Bhagavatam, Srila Vyasadeva’s own commentary on his Vedanta- sutra, states that in previous ages meditation, religious rituals, or worshiping in the temple may have sufficed, but in this age these methods are effective only in conjunction with regular chanting. And again in the Bhagavatam, Vyasadeva writes that Kali-yuga is an ocean of faults with one saving quality: simply by chanting the glories of the Lord we can free ourselves of the material miseries and attain the highest perfection of spiritual life. With these and other verses on His lips and with the assistance of His many associates, Nimai spread his sankirtana movement throughout Navadvipa and into East Bengal. He married at an early age, but as a householder traveled frequently, leaving His young wife and elderly mother at home. Sankirtana so absorbed him that He introduced a system of Sanskrit grammar based on Krishna’s names. Every word from His mouth was either chanting or glorification of the chanting. Even Nimai Pandita’s students began to criticize what they considered His excessive absorption in the holy names. Although not personally bothered by the criticism, Nimai took seriously His sankirtana movement. He ambitiously desired to spread sankirtana to every town and village of the world, giving everyone, whether educated or illiterate, access to Vedanta and to the perfection of life through the chanting of the holy names. If even His own students took Him lightly, how could He expand His mission? So in the year 1510, at the age of twenty-four, leaving home for good, Nimai traveled to the village of Katwa and accepted the sannyasa order from Keshava Bharati, a sannyasi of the Sankarite school. It is still the custom in India to offer respect to a sannyasi, and this was even more the case five hundred years ago. Nimai wanted that public respect and attention for the benefit of the sankirtana movement, which was, in turn, for the public’s highest benefit. Although Nimai abhorred Sankaracharya’s quasi-Buddhist philosophy, Sankaracharya’s influence was so strong that people thought one could accept sannyasa only in the Sankarite disciplic succession. So in pursuance of His mission, Nimai took sannyasa from Keshava Bharati, receiving the name Sri Krishna Chaitanya. Prakashananda Saraswati might have collected some of these details about the tall, golden sannyasi now dancing and chanting through Varanasi’s narrow streets had he asked around town. As dean of Varanasi’s scholars he might have thus avoided his criticism of Krishna Chaitanya. Lord Sri Krishna Chaitanya is known as the channa avatara, or “hidden incarnation,” because He never presented Himself as God or allowed anyone to call Him God. He always acted as God’s servant and as the servant of the Lord’s devotees. This age is so full of incarnation wannabes, so ridden with philosophies asserting that in the end we are all God, that God Himself demonstrates and relishes devotional service to Himself through the chanting of His names. As a grade-school teacher, to teach her students how to learn, sometimes pretends to be learning her ABC’s, so in the form of Sri Krishna Chaitanya the Lord takes the role of His own devotee and demonstrates the art of His own devotional service. 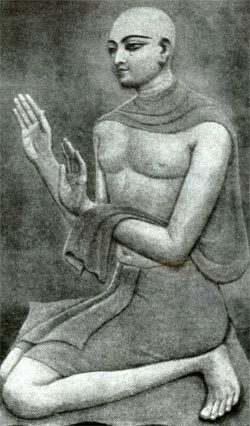 Hearing of Prakashananda’s criticism, Lord Chaitanya demonstrated how members of the sankirtana movement should be unconcerned with their own prestige. To further sankirtana the Lord had planned a trip to the holy city of Vrindavana, just south of present-day Delhi, and didn’t see any reason to alter His itinerary to defend His reputation by crossing swords with Varanasi’s elite. Intellectual tournaments were a thing of His past, of His heady school days. There was no need to interrupt His preaching for a debate. Better to push on the chanting of the holy names. There were plenty of receptive ears and many followers who needed His personal attention and instructions. But Lord Chaitanya’s followers in Varanasi were upset by Prakashananda’s remarks. It broke their hearts to hear their beloved Lord labeled an illiterate fool. At the same time they weren’t confident enough to confront Prakashananda themselves. What were they in comparison to this celebrated leader of Varanasi’s many faculties and academic departments? How could they present their case for the divinity of Sri Krishna Chaitanya and for the transcendental stature of sankirtana to a critic who could so expertly quote the Vedic scriptures, brandishing his learning and credentials? When Lord Chaitanya returned to Varanasi from Vrindavana, He stayed at the house of Chandrashekhara, took His meals at the home of Tapana Mishra, and spent two months instructing Sanatana Gosvami, the former prime minister of Bengal’s ruler, Nawab Hussein Shah, on the science of devotional service. Hearing this plea, Lord Chaitanya remained indifferent to the criticism of Himself, but felt compassion for His hosts and other followers, understanding their distress. At that moment a brahmana came to the Lord with another appeal, this one an invitation. It was a long-standing custom for the brahmanas of Varanasi to take turns inviting the local sannyasis to their homes. In this way there was a daily gathering of sannyasis, a moveable faculty lunch. Lord Chaitanya had always been absent, declining all invitations until this one, which He gracefully accepted to please Chandrashekhara, Tapana Mishra, and the brahmana. Here was a timely opportunity, made possible by His own omnipotent arrangement, to meet Prakashananda Saraswati in a congenial setting as fellow guests at a brahmana’s home. As faithful servants of Lord Chaitanya, Chandrashekhara and Tapana Mishra aspired to become expert preachers of His mission who knew perfectly and could teach that Vedanta, the end of knowledge, is loving service to Krishna, the supreme person, through the chanting of His names. For now, however, what they knew, giving them joy and relief in anticipation, was that Lord Chaitanya, their own teacher, had agreed to meet Prakashananda Saraswati, head of Varanasi’s intellectual elite, for lunch.